Do your staff have the skills and organizational structures to manage and implement a marketing and communication strategy? Or even the basic skills to communicate the key points effectively, internally and externally? We provide a range of services to bring staff up to speed, from capability assessments and organisational reviews through to training in writing skills, media relations, and storyline development. We have particular expertise in helping organizations strengthen their ability to produce high-impact content for reports, bids, presentations and other materials. 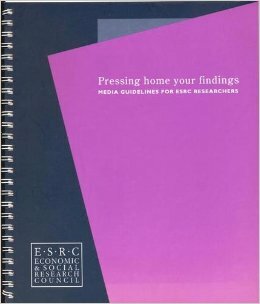 We produced media guidelines for researchers funded by the Economic and Social Research Council (ESRC), covering all the key steps to generating media coverage, from identifying the key messages and writing news releases to managing press and broadcast interviews. The guidelines, Pressing home your findings, were adopted by numerous research institutions across Europe. We also run media workshops, including simulated radio and TV interviews. Most people struggle to remember an organisation’s ‘key messages’. But nearly everyone can recall a story with a clear beginning, middle and end - problem, solution, outcome. Virtually all effective communication, from major advertising campaigns to films, use this technique, which is essential to put an issue or ‘message’ in context. We’ve run highly regarded storyline development events for a variety of organisations from DFID country offices and UN agencies to multinational corporations.